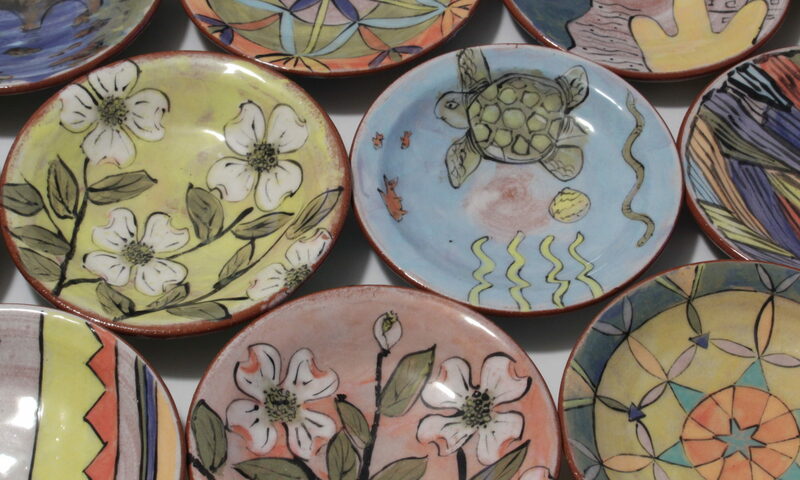 I made a few commissions and pulled them from the kiln last week. 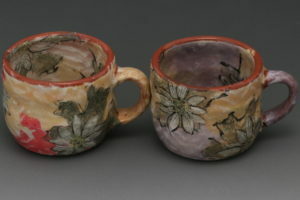 The ones I didn’t sell immediately I took to a work shop I did this past weekend at Pocahontas State Park. What a great time we had, but more on that in a post tomorrow. 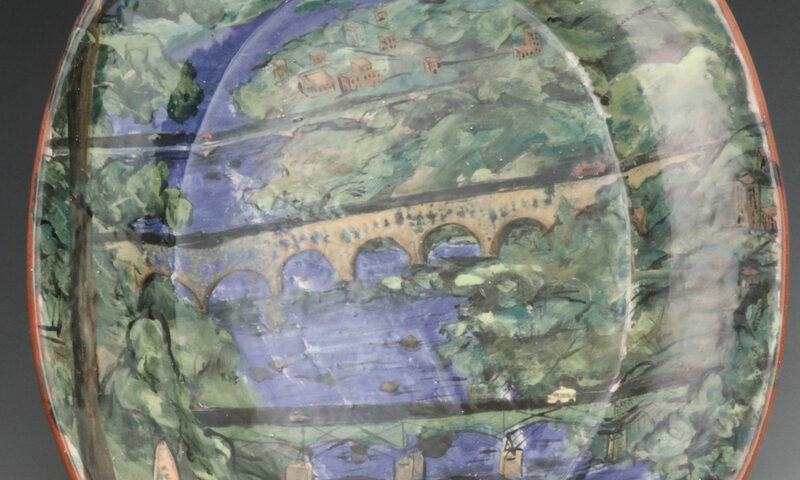 There are three different series created and shown here. I’m very excited in them and will tweak them a bit in the next round. 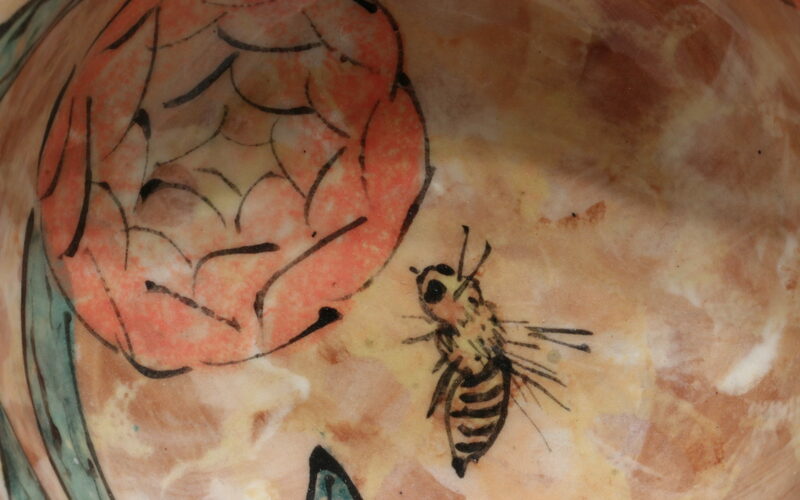 The new ones are the bees, macro imagery and the redbud flowers. 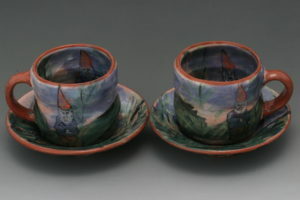 Mug and bread/dessert plates in a summer gnome design. I like the sound of this title. It makes me think of a horror movie title. I know I’m reaching with that one, but I have a vivid imagination. 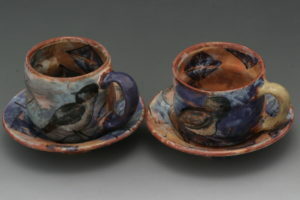 Here are a few cups I just photographed from my last firing. 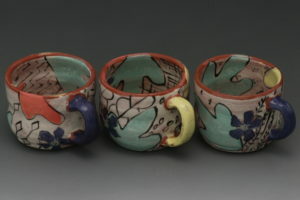 These mugs have the Japanese Oribe black markings on a white background, but instead of green glaze I added colorful splotches of color in stylized sassafras shapes. 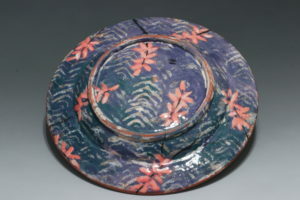 It is quite an assortment of different designs. The Gnomes and the songbirds are for a commision, but the others are for sale. contact me at hardwickhandmade@gmail.com if you are interested in purchasing them. 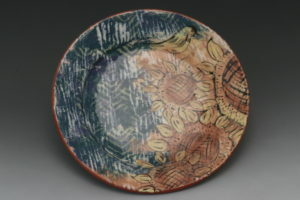 Last weekend I fired twice getting out several plates for a dinnerware order. Pictured here are the ones I have not sold. 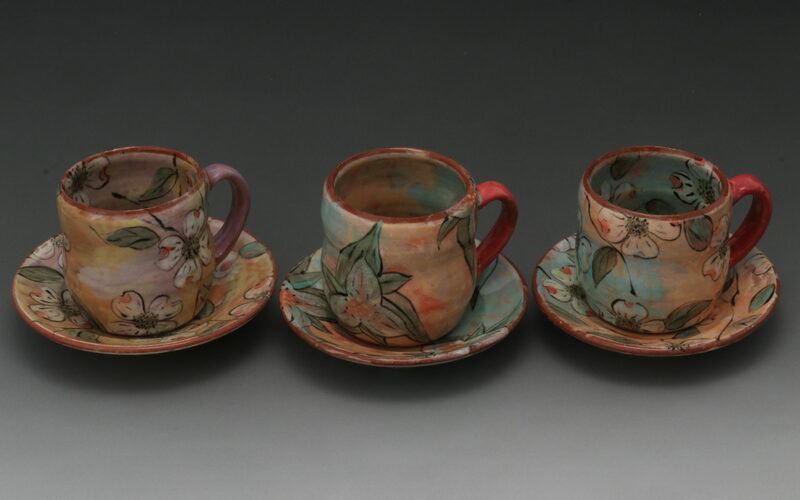 I did several Virginia native wildflower designs as well as geometric and Eastern songbird designs. I really liked working on them. 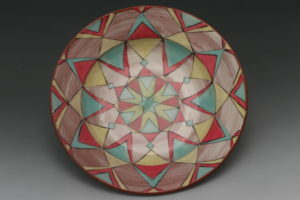 This series is based on my love of Persian pottery. Each style is working for me, but I like to change them a bit each time I do them to (in my mind) make them better or maybe, just to tickle my mood. 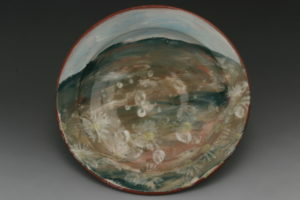 Dinner plate inspired by my time in the west where I gained most of my production knowledge. I hope you love them as much as I do. 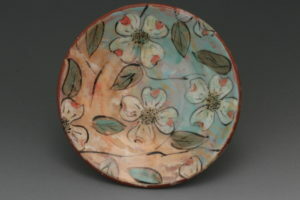 This little plate has my Dogwood flower pattern on it. 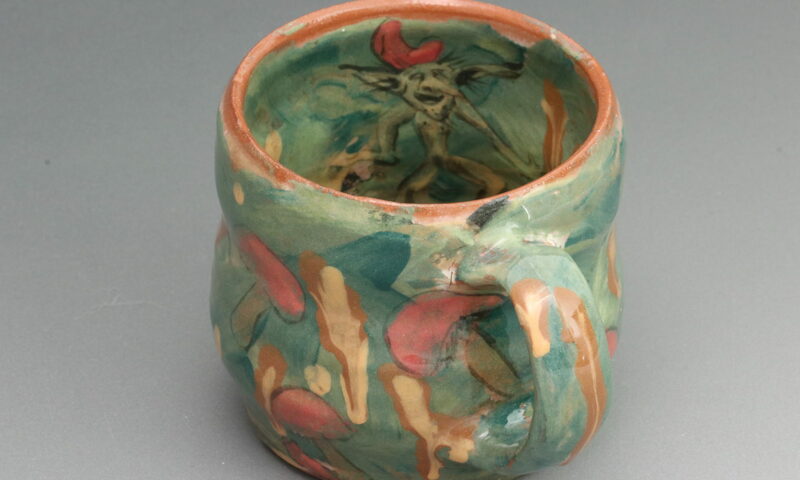 Yes, it seemed that only gnomes would enter the realm of little people seen on hardwickhandmade pottery, but the dark side has made an appearance. A small one granted, but an appearance none the less. 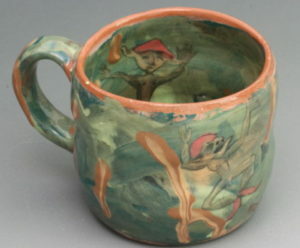 Two mugs have been designed with drunken goblins dancing about in a mushroom filled background with slipware highlights. 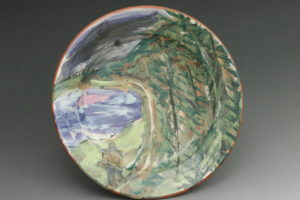 This series will draw from the slipware pottery (which are extremely difficult to pull off well) as well as from landscape painting traditions. 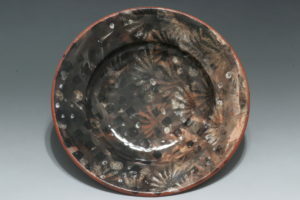 I finished a load of pottery and fired over New Years which was alot of fun. 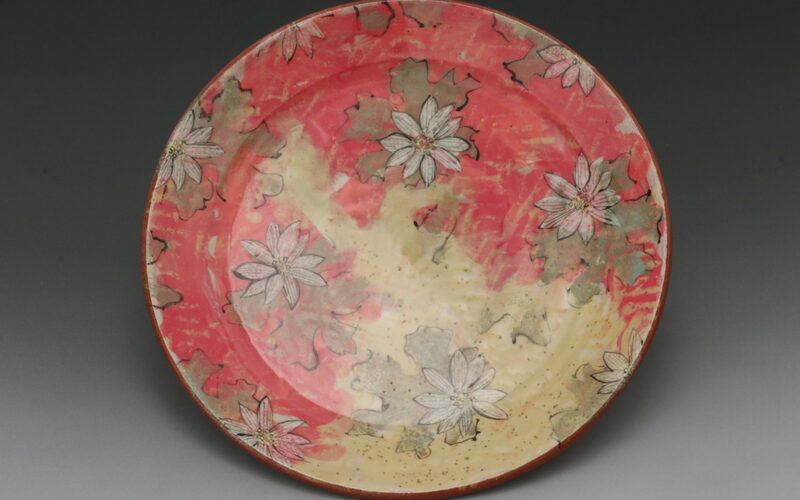 I had several items that I fired for a commission and then others that I was doing to figure out some design work. 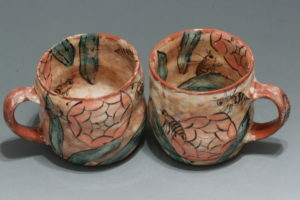 The whole kiln came out well. As discussed in the last post, I am working on a commission of eastern songbirds. 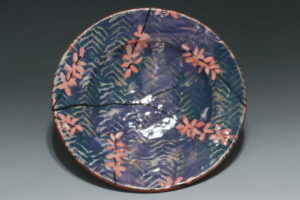 I’ve got to do plates and bowls which makes the layout a little more complex. A group of gnomes were fired as well and I liked how they came out. Also, I did a group of drunken goblins dancing around which came out well.